The Primal Blueprint lifestyle has positively changed my life, the lives of my family members, and a growing number of friends. I’m delighted to report that I (at age 59) have lost 42 pounds, 6% of my body fat and 25 inches. 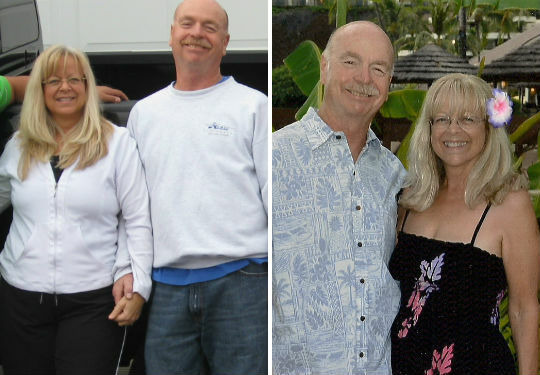 My husband (age 64) has lost 31 pounds, my grown children and their families have lost weight, look great, and we all have become much healthier, thanks to the Primal Blueprint diet and lifestyle. And, perhaps best of all, my fasting glucose readings have dropped about 70 points, to below diabetic level. In September 2008, I was suffering from worsening type 2 diabetes (on medication and under threat of starting injectable drugs), at the heaviest weight of my life (179 pounds, at 5′ 2” tall), and had a host of constant irritations. I had colds, headaches, stomachaches, lethargy, sweet cravings, horrible self-image, and basically felt lousy all the time. My husband was also at his heaviest weight, and complained of heartburn, irregular heartbeat, backaches, frequent sunburns, carb cravings and high blood pressure. All of these problems have since vanished, thanks to the Primal lifestyle. I’m one of those people who tried just about every diet: low-fat, cabbage-soup, Atkins, smaller portions, and more. I lost weight each time, but I always became overwhelmed by hunger, feelings of deprivation and frustration. Plus, I only regained all the weight plus more. After 20 years of unsuccessful dieting, I decided to “just eat without restriction,” which resulted in a gain of 15 pounds, since I chose to “just eat” dessert with almost every meal! I laugh now, but at the time, I had zero self-respect. The Primal Blueprint book was sent to me by a friend in early 2009. I stayed up all night reading it. I was excited—it made so much sense! 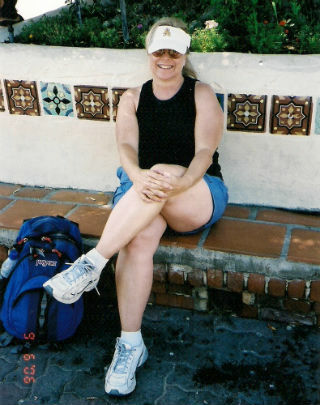 But I was also skeptical—I had followed the Atkins diet to the letter, lost 25 pounds, then gained it all back. I did not yet understand the power of real food! It took a while to sink in (I was in denial), and even longer to implement entirely (almost 6 years!). We began to make small changes. We cut out most desserts, cut back on grains, ate more veggies, and started reading labels. In August of 2009, I went entirely grain-less. We began to take long walks regularly. We created eating and exercise diaries, in which we recorded our daily weight, foods eaten and exercises (I still do!). I was probably 75/25 Primal for the first couple of years. By September of 2010, I had lost 19 pounds, exercised about 5.5 hours per week, and my fasting glucose levels had dropped from about 170 to about 135. Then I began to fall back into some of my old bad habits. I ate “a treat” here and there (which, in review, was several times a week), slacked off on exercise, worked too many hours, and, by 2012, I had regained seven pounds. I was pretty darned depressed. Looking for support and hoping to get myself back on track, I started a private group on Facebook called the F’nE Club (for food and exercise). As it turns out, the group was to bring me success! Several of us, including my daughter and daughter-in-law (both members of the group), decided to do the The Primal Blueprint 21-Day Total Body Transformation together. I bought the book for each participating member. We started The Primal Blueprint 21-Day Total Body Transformation Program on 4/29/2012. Using the F’nE Club as our connection to discuss, complain, share recipes, and report on pounds lost, we compared notes daily (sometimes hourly! ), and used one another for support. It was fun! I lost eight pounds, but more importantly, I woke up to the fact that I had been cheating myself. I had not been eating nor living nearly as primally as I thought I had. I began creating new habits: truly eating only real primal foods, getting out of my chair and circling the office every half-hour at work, taking a pleasant stroll each morning in my new Vibram 5 Fingers, spending 15 minutes every afternoon in the sun, doing my PEM workouts, sprints, and walks, fasting for 24 hours once a week, and cooking at home much more often (we love The Primal Blueprint Cookbook—especially the Zucchini Egg Bake and the Jambalaya). I was so delighted with the results of the 21-Day Total Body Transformation, that, a week later, I did it again! And again a few months later! I lost another 10 pounds, and I found a new life plan for myself. Also, my glucose levels continued to drop. By the end of 2012, my doctor approved ditching all diabetic medication! Freedom! In January 2013, my husband and I retired from work—hurrah! To celebrate, we treated ourselves to a 28-day spring cruise of the South Seas. Using the techniques we had learned, we ate primally with ease (delicious fresh fish and veggies daily, sharing a tiny dessert most evenings), walked the decks, snorkeled, hiked, and had a complete blast. I only gained two pounds! Since then, we have traveled extensively and not gained weight. In fact, I have steadily lost weight while enjoying the heck out of exploring! While on the cruise, I discovered another key to my weight loss and health puzzle: Zumba dancing! The Zumba workout is the perfect exercise for me. It’s interval bursts of hard exercise—jumping, kicking, leaping, high-knee running in place—inter-spaced with short periods of rest, upper body weights, squats and lunges are ideal. And it’s all to the beat of international music with the fun atmosphere of a party of friends! I joined a local Zumba class upon arriving home in June of 2013, and I now attend three awesome one hour classes a week, from which I leave drenched but happy. (A classmate’s fitbot calculated that we burn over 1,000 calories per session.) After class, I do a short PEM workout at home. Sprints and lifting heavy things? Check! Three evenings a week, my hubby and I walk for an hour in our local park (a relaxing, peaceful time for us to talk), and we also hike, bike, kayak and swim frequently. Long and slow? Check! All together, I now typically get 10 hours of exercise a week. On 4/24/2014, I reached my weight goal: 40 pounds lost! That was six months ago, and since I have maintained easily, and even lost another two pounds without trying. My weight dropped from 179 to 137. My fasting blood glucose reading is typically about 100 these days, dipping into double-digits occasionally! The Primal Blueprint plan is my lifestyle now and it’s easy and enjoyable. It’s the way I will eat and live for the rest of my life. 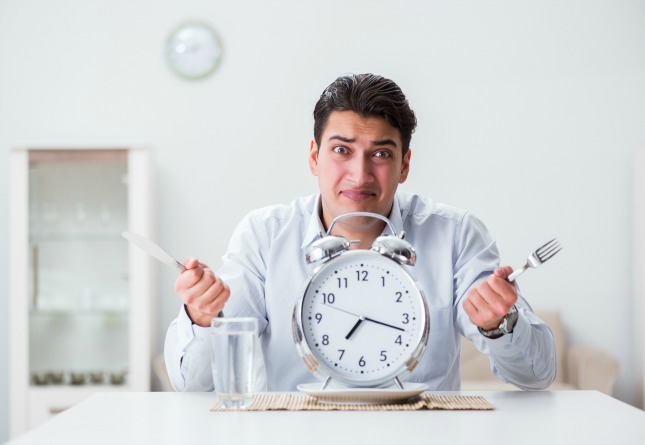 We eat two meals a day (brunch and dinner) resulting in about a 15 hour fast daily. Our primal brunch includes pastured eggs, lots of organic veggies, pastured butter, herbs from my garden, coconut milk, tea, uncured bacon or sausage, sometimes coconut flour/milk/oil pancakes, fresh berries or other fruit, raw nuts, and/or plain Greek pastured yogurt sweetened with stevia. Dinner is pastured, grass-fed, organic meat and/or fish (when available—we choose the best options possible when on the road), lots of veggies, salads with vinaigrette, butter, and occasionally coconut products, raw whole-milk cheese or sweet potatoes. I relish my 1/2 ounce of dark chocolate daily, and enjoy a full fat, full sugar dessert of my choice twice a month (though there are few sweets I can eat these days without stomach pain and a sweet-hangover-of-awfulness afterward—they are becoming less appealing all the time!). Recently I have been experimenting with resistant starch to lower my glucose spikes after exercise (with good results! ), so I have included a half-cup of sprouted brown rice cooked in chicken bone broth, cooled and eaten cold, four hours prior to hard exercise. To prevent my lifelong habit of regaining lost weight, I created this system: I have an allotted weight range of four pounds to allow for fluctuations. When I reach the top of that range (which for me is 140 pounds), I begin “Me Minus,” which I continue until I drop back into range. Me Minus is Primal, minus these foods: chocolate, sweets of any type, dairy, fruit, nuts and starchy veggies. Pretty much it’s all meats and veggies with fats. Not much fun, but very effective. These days I rarely have to resort to Me Minus eating because my weight stays low in my weight range fairly effortlessly—my dream come true. Today, I’m about 90/10 percent Primal. I feel so great, tremendously proud of myself, and amazingly content. What a gift The Primal Blueprint has been! Thanks and Grok on! Thanks! Love your name and profile pic! Aww, thanks, Melissa. I feel wonderful, even if I’m not getting any younger! You look so happy and healthy! Keep it up! Thanks! Great to see doctors following the primal lifestyle. Do you happen to practice in Phoenix? Great job Barbie. Congrats. I hope you put the Primal Blueprint book down after coming to the part about the importance of sleep, lol! Your story, your actions and methods are significant and not just a normal Friday story. As you and all of us past a certain age know, accomplishing weight loss at this age, even following a primal lifestyle, isn’t without challenges. I think what you have done and the way you approached your lifestyle changes and improvements are proof that being primal can work at any age. You are an inspiration in this household. Well done and may you continue to have success personally, and with getting your experiences shared across this community. Thank you for sharing with us! Thanks, Guy. Yes, weight loss and change in general is more difficult as we age, for sure. It took me almost 6 years to do what I read many young folk in the primal community do in just a few months. But, we of the wiser years have dogged determination on our side! Thank you for your kind words, they mean a lot. Always inspiring to see it’s possible to create a longlasting positive change, no matter how bad your starting point. Congrats to the amazing lady and her husband! Thanks so much Sandy and my hubby says Thanks, too! I learned the hard way that there’s not much point in the effort of making changes if they don’t stick. Primal works. You are an inspiration! I love the N’nE club and the way you have created a smart strategy that embraces pleasure and fun, as well as community with other women! I am 40 myself, and it’s wonderful to know there are women like you out there that I can look up to! Thanks, tkm! I posted the success story to my F’nE Club today, and told them they’re now famous! They have been such wonderful suport. I love the thought that someone looks up to little ‘ole me, and I hope my story helps others take the steps to get healthy. Congratulations to you and your family and friends who’ve followed your lead. Others, who read your story, will surely take inspiration and follow as well. Thanks, John, I hope so. I know how motivating the success stories on MDA were for me, as I took up the primal lifestyle. I love the thought that mine will be of help to someone. Wonderful job, obviously you’re feeling as great as you look! If you can survive cruises you have mastered your Primal discipline. It was our first and only cruise that sowed the seeds for our Primal journey. The boat of bloat, an Italian menu, that was our lowest point. Now that we know our way around a gym we could probably do better. The greatest thing about retirement is having endless time and options for exercise and the total control over your daily environment makes it easy to eat right at all times. You can expect to get even healthier, truly 60 is the new 40. LOL, Bayrider! Yes, when we set sail on the cruise, we were very worried about returning 30 pounds heavier! But we found it quite easy to eat primally. We avoided the bread table (which was easy as it was set apart), and focused on the amazing fresh fish, veggies and fruit from the islands. Plus, we made a pact to never take the elevator on the entire cruise (with the exception of dress-up nights, when I wore high heels!). The ship had 15 stories! We climbed over 10,000 flights of stairs! You’re right, at 60, and armed with my primal lifestyle, I have a long and healthy life ahead of me. Thanks and best wishes on your next cruise! This is by no means an attempt to diminish this great succes story, of wich I think is truly amazing, but my GOD I lost count of how many times I read the word “weight”. Beware of comments that begin “not to…, but.” You can be sure the person is about to do what they just said they don’t mean to do. Why single this story out if you’re tired of reading the word “weight”? Almost every single success story on this site is about losing weight, and almost every comment congratulates the person on how great they look. When you write your story, you can use whatever words you like. Barbie, thanks for sharing your journey to good health. Your energy and enthusiasm shine through your words and pictures! I’m inspired by the many ways you’ve changed your life, and especially by the many different ways you’ve found to be more active. Keep it up! Thank you, Beensi, for coming to my rescue! 🙂 We probably ‘shouldn’t’ be so concerned about our weight, but it’s a measure of our health to a certain extent, and there absolutely was no question that I, personally, needed to lose some! But I do tend to go on and on about it! I appreciate your kind comments. Exercise is now fun, since I decided to try some options that let me get outside, or dance with friends. Good health to you! On contrary, I don’t think I diminished the success story, of wich I still think is amazing. My reply was only an expression, probably most unnecessary, for an ongoing feeling while reading. And Barbie, I think you did right by not seeking out synonyms only for the reading pleasure of others. This story is yours and your weight means a lot to you. Your story is vibrant and your positive spirit shines through, the world would be a nicer place if more people had your outlook and energy. Peter, in retrospect I should have researched some synonyms for the word ‘weight’ (which is complicated by being the same word we use for the number we see on the scale, those things we pick up for exercise, and a verb meaning heavy). I just wrote the story the way I’ve told it to dozens of friends, rather than getting all polished about it. Thanks for the kind words, Peter. Very inspiring!! I loved reading this, congratulations on all your successes!! Your story was the final push I needed to start my Primal journey. We are about the same age and have similar “dieting” history. This time next year I hope (will) have a success story too. Thank you and congratulations! Yay Lori, that makes me so happy! You can do this! The Primal Blueprint was the answer for me – good luck! I will look forward to reading your success story soon! Congratulations! And thanks for sharing your general meal plan and your approach to creeping weight gain. I also have a 4-pound weight range I’m happy with, just hadn’t come up with a systematic approach once I find myself at the top of the range. Thanks, Miz Pat! ‘Glad my specific plan was a help. The creep has always been my downfall – no more! Hope it works for you, too. Congratulations Barbie, what an inspiration. 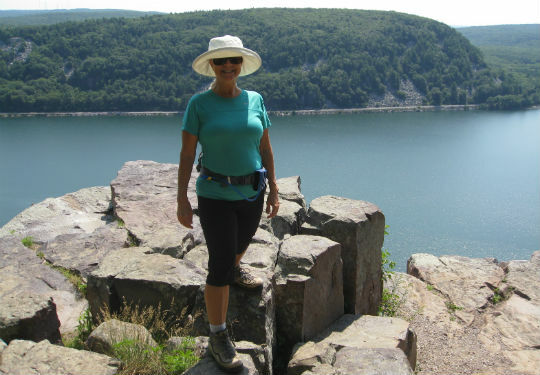 There’s not many primal/paleo success stories around from women in their 50s – I’ve looked! But you’ve certainly got me thinking more. Love the FB idea. You deserve your fab results. You’re right, Lynne, and thank you! It was sure helpful to have a support group. The most difficult part is understanding that others don’t have the passion for the Primal lifestyle that I do…I’m trying to walk the talk! Well done Barbie – you and hubby look great! You used some good strategies for beating your weaknesses (as highlighted by previous diet issues) – I’ll be trying some myself. I hate ‘journals’ (every diet says to use them) and yet them seem the best way to hold yourself to account. Thank you, Grokesque (great name! ), I hope my ideas work for you! I use my little facebook group as my journal, when I need extra support. Since it gives feedback, it’s very motivating! Hubby says Thank you, too! Oh my gosh, Barbie, you look fantastic! I really appreciate your comment about allowing the four-pound fluctuation. It’s so important not to freak out when the scale varies, which of course it does every day for everyone. Congrats on getting off the drugs, too! You are so sweet, Pamela, thank you! Yes, the weight range is a big part of retaining results. Keeping it off is the most challenging part. And, I sure don’t miss those meds (they didn’t work, anyway). Barbie! What an inspiration! I’m almost 50, so I’m looking for stories such as yours. I suspect the “F” in “F’nE” might mean something else, lol! I love the Me Minus plan. Thank you for articulating it! You are on to me, Monikat! 🙂 Yes, the F’nE Club has a double meaning! Thanks for your kind words. Two things I am taking from you is Me Minus eating and eating two meals a day. Thanks, GrannyGrok (Great name, we Granny’s rock!). When I go back to three meals a day, I start gaining. I’m a slow starter in the morning, so it’s easy to procrastinate til mid-morning before cooking. So my laziness becomes a positive! I started Me-minus today, in fact, due to *3* Thanksgiving feasts (though mostly Primal, it was a *lot* of food!). Wow, great and really helpful story! Thanks so much for sharing these useful tips and perspectives. So happy for you, and you and your husband look great! Thanks from both of us, Spinner! What an accomplishment Barbie – very well done. So great to hear your story!! Thanks for sharing Barbie! I’m 45 and have similar experiences with weight. The 40’s are the worst for me as dieting only holds the weight to a slower gain rather than losing any weight at all. I have Hashimoto’s (thyroid disease) and have learned from trial and error that a modified paleo diet (No nuts or beans; potatoes and rice okay) helps to control my health issues greatly. I was very ill for years that only recently have I been able to really walk any amount. I think exercise is the key, not so much because of burning calories, but due to the release of hormones like growth hormone. Growth hormone, in turn, causes appropriate thyroid hormones to be converted (for those who want to know, it turns T4 to T3). Once I reached 10K steps a day for a month or so, the scale began to move the other way, albeit slowly, and now for the first time in a decade I have lost more than 10lbs (30 to go). Exercise is the key to weight loss for us perimenopausal and menopausal women. Great Job, Barbie! And thank-you so much for sharing your story with us. Staying fit does become more difficult as we age, right Anne? It sounds like you’ve experimented on yourself, like I have, and found those foods that work best for your illness. Exercise was always the easy part for me, it was diet that knocked me down every time. I thought it was me, blamed my lack of willpower or fortitude…but it wasn’t me, it was the wrong science that I was trying to follow. Primal was the answer. Good luck and good health to you! Hey, Kay, a fellow Me-minus-er! Yep, I love having a definitive plan for the weight creep. Also, watching the scale daily allows me to track inflammation-causing foods, by examining my diet on those days I suddenly gain a pound or two. Enjoy your juicing, keeping at it, and hope those little indulgences are kind to your arthritis. Thanks for taking the time to share, Barbie! I loved reading about your bumpy road and it seems like you’re now on a smooth path to live a long, healthy life. How empowering! And the Me Minus is a new expression for me… I do something similar, but it was great to read as a confirmation. All the best! Thanks Irma! I stumbled on the Me-minus idea…it’s been super helpful. Hey Mark – maybe you should write a post about the concept! What a great story! I really appreciate you outlining exactly how you got to be the success that you are, and the steps you are taking to continue to be successful. You and your husband both look vibrantly healthy. Congratulations! We thank you, JennF! The devil is in the details, right? That’s why I included them, glad it was useful. Thanks for your kind words, we feel great! Thanks for your story and inspiration, especially to diabetics. I have a lot of, frankly, anger towards big food, big pharma, unquestioning doctors and dieticians, and heart, and diabetes associations. But mostly the American Diabetes Association. How dare they say search for the cure? 100 years ago if you got type 2 and went to a doc or hospital they put you on low carb. The ADA buried this info because it doesn’t make their supporters money. Let me repeat that. The ADA doesn’t search for a cure THEY BURY the known cure or at least known way to manage. In my second 5K there was an ADA booth. I went over and I kid you not the person staffing it pulled out a bagel. I said that is not cool to show when you are representing info for diabetes. She said her doctors told her she needed to eat carbs constantly or her blood sugar would go too low. She said she would die on low carb and there was nothing she could do but insulin. I told her about Eric Westman and T1 and T2 managing diabetes without insulin. I flat out said you should not eat bagels at a diabetes booth as that is the cause of T2. Like swigging a Bud at an AA booth or smoking at cancer booth. Was she personally responsible for how messed up the ADA is? No. But when she chooses IN PUBLIC to spread misinformation and pain and suffering, I have the right if not responsibility to not just sit idly by. She got upset, I held my ground. We don’t let the ADA do their business as usual. My family has suffered mightily from T2. The ADA’s ‘reign of terror’ is over. At least as much as I can do to make that so on my watch it is. Why? Can I really try to do anything less? Bravo Larry – good for you – because small changes can add up to big changes and I can just picture you at the booth trying to share. and one thing to keep in mind is that many times people listen now but “hear” you later – and so even the most stubborn ones will sometimes later have truth sink in. It is kind of like dealing with teenagers – they resist listening and get defensive because you know – they already know it all – but later – when defensiveness subsides – their rational and mature side chew on things – and well, it takes time – but truth can permeate and it takes us not looking the other way or passively thinking folks are unreachable. (just have to make sure our delivery is not harsh – can be passionate – but not rude and mean or condescending). and larry good for you for speaking up at that booth – and I ddi not know that 100 years ago they talked about the nutrition connection to T2 – makes sense – and that was also when enemas were valued for the help they offer – but nowadays no ill people are told to do them or even told to do a gut cleanse or even told to look at diet. I heard it is because the big pharma control what is taught in med school – and every doctor I met has wanted to really help – but their training was slanted towards what they learned – which was scripts and treating symptoms and not root causes. anyhow, your comment inspired me (as did Barbies story) but it reminded me to make the effort to share truth with others – especially with such contradictory situations like this bagel eating rep…. I recently heard one person raving about how at a cancer recovery center they had cookies served to recovering patients (the sugar poison to the immune system and then feeding the fungal connection to cancer – yeah, not smart)…. I hear you, Larry. I’m angry too, and I know your frustration – it’s like fighting windmills. My endocrinologist is not happy that my health has improved, because now I rarely visit and I no longer take the meds she used to dispense to me (with a kickback, no doubt), so she doesn’t make any money from me anymore. At first I’d try to tell her how I was getting such great results, gave her the MDA website several times, even brought in articles about the Primal and Paleo lifestyle…she never read them. I don’t bother anymore. I see her every year and a half, only so she can write scripts for my testing strips and hand me the results of my improving A1C tests. The medical system is unfriendly to people with metabolic diseases. How sad is that? The ADA is just criminal. The story I’ve heard is this: they recommend a “heart-friendly” low-fat diet (which, of course, we know is the opposite of what is needed) because the number one killer of T2 diabetics is heart disease. Yet – they know that this prescription worsens blood glucose levels and therefore, diabetes. And who supports the ADA? All those advertisers of drugs, supplements, programs and fake ‘diabetic’ foods. They all need sick people to stay sick, in order for their businesses to stay alive. Sad state of affairs. I sure do hope emerging young docs will break the mold and dare to rebel. Mark Sisson is doing a good job of getting the word out to the average diabetic Joe and Jane, and you and I are doing our part, too. Change *is* happening, albeit very slowly. Best of luck to you, wishing you excellent health, and keep up the good work! Very nice article about achieving results:). Everyone should concern about health. Barbie, you are my hero! I was diagnosed diabetic in March. My drs are supportive of me following a path like yours. I have lost 50# following Primal about 80% of the time. My A1c has dropped 3 points. My fasting glucose is not normal YET. I am confident it will be better in time. I need to up my Primal and decrease the bad stuff even more. My work is fairly active, but I’m going to take a spin around the floor every half hour. Love that idea! I’m 58, a grandmother and soon to be formerly diabetic. Yay, Teri! Thanks for your sweet words, and I’m so glad my story is helpful! That little walk every half hour seems so simple, but it’s a life changer. I got the idea from Mark Sisson’s book The 21 Day Body Transformation. It’s not just the daily exercise, it’s the continual movement that our bodies need to keep things running properly. Congratulations on your A1C drop! And your weight loss, woot woot! How lucky you are to have such supporting docs (I do not)! I see my fasting glucose drop substantially when I eat Primal ‘ME-Minus’ (no fruit, chocolate, nuts, any sweetener, or dairy). It’s not a diet I could live on, too restrictive, but it might be worth trying for short periods (a few weeks at most) to see if it helps drop your fasting BG…? Good luck and I can’t wait to read your success story here! Congratulations from another Zumba fan! I also have to ask…is your “after photo” at Devil’s Lake WI by any chance? You named it, Nicole! My hubby and I attended a family reunion there a few months ago. Beautiful place and great hike! We then traveled cross-country by car for the first time, saw 22 states, such fun! WOW that’s sounds like a great trip! Thanks Katie, you can do it! Great story! I wish more Americans would put diet and lifestyle over taking a ‘pill for every ill’. Me too, Green Girl, and thanks! Many don’t think there’s another option besides pills, sadly, or that they can’t stick to, or won’t enjoy, a real food diet. Wish I could convince them all to try it! What a great story…especially impressed with your series of action plans to make all of this happen…not always easy, but so worth it…thanks for the inspiration! Thanks Jenna. My quick-witted brother has named me ‘The GrokStar’ since this story was posted, snd now my hubby has taken the moniker up – Hahaha! Congratulations to you and your husband and the rest of your family. I love the concept of Me Minus! It’s going to be my holiday go-to plan. Thanks Shireen, and good luck! Great job, and such an inspiring story! Barbie, I had to dig to get to the end of all the comments. I’m 57.5 right now and have been messing around primally/paleoly for about 2 years. You just gave me the kick I needed. I was initially drawn by the photo of you sitting on Crescent Street in Avalon as that’s one of my favorite places to go but your story really lifted me. Glad to hear it! I’ll turn 60 this year, and if I can do it, you can, too! Good luck! I love your Me Minus idea! Thanks Suzanne, it works! I stayed on Me-Minus for 3 weeks after Thanksgiving and dropped another couple of pounds, for a total of 44 lost now…and I am confident they’ll never be regained with my plan – yay! Thanks for sharing your story. We peri-/post-m. women need more of these stories!! Thanks Rebecca, sorry for the late reply, just discovered your comment! I recruit women for my little group from a variety of sources: Facebook main friends who show an interest in health, family, Zumba-mates, even a few from my poly-debate group! Whenever anyone shows an interest in diet, I send them a little note with an invite. Most are not primal, but I’m workin’ on them! Would you like to join our little club? Thanks, Beck. Keep it up, you’ll get there. I’m a week away from one year of maintaining my weight loss, plus another 4 pounds gone since. Yay Primal! Very inspirational story. Thank you for sharing. Your story renews my motivation to achieve the success that you have reached and maintained. I have not been as “Primal” as I thought I was being and have rededicated myself to the Primal lifestyle. Thanks, Debbie. Keep it up, it gets easier the further in you go, good luck! Barb – Thank you for a well-written, inspiring story. I am once again on the Primal path, in hopes of losing weight as well as improving my health overall. I read your story, though, not for me but for the man in my life. We started dating over a year ago. He has type 2 diabetes, and I would love for him to try Primal/Paleo. He still eats bread/pasta/taters/etc, and a good number day for him is under 200 – barely. He is not severely overweight, and as a carpenter is very active all day. But his need for insulin and the fluctuating blood sugar has me concerned. 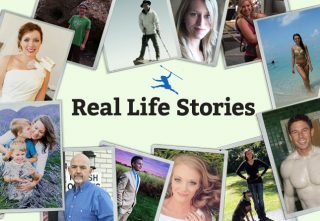 Your story, and others like it, might be part of the initiative to give the Primal lifestyle a try. Thank you again, and congrats on your many successes. Hope you’re able to influence your guy, Judi. Making the switch to Primal will help him dramatically, but diabetics crave sugar & carbs, since our cells are starving, even though it makes us sicker, so it’s tough. I’m officially no longer a diabetic now, thanks to the PB, even though my doc said it couldn’t be done. And i no longer have constant cravings. Keep after him & good luck! I have an exciting update to my story: yesterday I learned from my doctor that my most recent blood test results show that *I am officially no longer a T2 Diabetic*! My numbers have dropped below diabetic level, back to ‘pre-diabetic’. My new goal is to get them all the way to ‘normal’. My doctor was shocked, she was sure, after 14 years, that this was impossible. I gave her the MDA website and sung it’s praises! Did so on facebook, too! Thanks, Mark! Thank you for sharing your success story. I can relate to a lot of it. I am just getting started agian and you are a real inspiration. Grok on! Hang tough, Jodi, you can do this! Wishing you much luck! Congratulations on your perseverance Barbie. You look fantastic!!! You’ve inspired me as I want to lose weight before my 8 week holidays in Europe in just over 3 months. I am planning to be primal at least 80% of the time because I don’t feel good when I eat grains and sugar. Thanks Lisa! Sorry, just stumbled on your comments, hope your trip was a blast, and that you were able to stay Primal! you are just inspirational. I am doing the challenge for the first time. I live in Australia. you look fabulous! I am working full-time but need to make the time to move much much more. I like your Me Minus idea for life time maintenance!!! I must remember that when I get to my goal. Thanks Eleanor! Hope the challenge went well for you, and you are a model for the Primal lifestyle in Australia! Best of luck to you! I am so glad I found your success story! I’ve yo-yo’d with diets for years, horrible arthritis in knees and back and just was getting depressed. I stumbled across Paleo living, and most of the success stories I found were “youngin’s”. I’m 50 and wanted to read something from a female in her 50’s who had success. And there you were! It gives me hope that I CAN do this too! No more dieting-lifestyle changes, healthy living are the way to go. I am so happy for your success! I hope to have my own success story here as well someday. Here’s to your continued success! Thanks Eleanor! I will turn 60 in a few weeks, and I have lost another few pounds for a total of 45 now, on my Primal diet & ME plan. I have more energy now than I did 10 years ago, thanks to the Primal lifestyle. Hope your arthritis improves. I look forward to reading your success story here soon! Oops, meant to say Eileen! Good luck! Congratulations Barbie. You might not realize it, but you’re very close to following my recommended Lifestyle of LCHF ( Low Carbs, medium proteins and high healthy fats/oils !) I’ve become a Certified “Banting ” (LCHF) Coach through the Prof.Tim Noakes’ Noakes Foundation and assist people in my Groups. Congratulations on your weight loss! You look absolutely stunning! It is amazing what getting back in great shape can do to you not only physically but mentally too! Keep up with the great work, and thank for sharing the information about this diet. I must admit I hadn’t heard it before, but I will check it out! Thanks so much Laura! This week I’ll celebrate 3 years of maintaining my 40 pound weight loss, and I couldn’t be more delighted. I think I’ll write a follow-up to this story and send it in to MDA. Barbie, I’d love to publish your follow-up success story. Readers are always asking to hear how folks are doing in the long-term. I think sharing how life and health continue to evolve over time makes for a powerful story. Grok on! I was just diagnosed with diabetes in January, thank you so much for your inspiring testimony. You have motivated me to start the 21 day transformation challenge (which I own but never used). Hi Denise, sorry it took me so long to see your comment. I hope you found success with the 21 day transformation challenge, like I did! This is inspiring. I too have Type 2 Diabetes… diagnosed about 18 ms ago. I have lost the weight my doctors wanted me to lose (50 lbs; I am now at 120 lbs), but my blood glucose numbers are still bad despite multiple oral meds (and a nighttime insulin shot). Very frustrating. I think I may try this and see if it will help my situation! Thanks TraceyA! I hope you’ve had better luck since starting Primal. I’m currently experimenting with Keto (and looking forward to Mark Sisson’s new book on the subject) to see if it will further reduce my glucose numbers. Primal was the answer for me, and real food is how I’ll eat for life. If you haven’t tried it yet, I heartily recommend it. Good luck!